Shi Shi beach, Washington is a wondrous natural wonderland featuring natural treasures including romantic seastacks, beautiful ancient spruce trees, giant logs, and majestic wildlife. Shi Shi Beach is located on the northwest tip of the contiguous United States in the Makah Reservation. 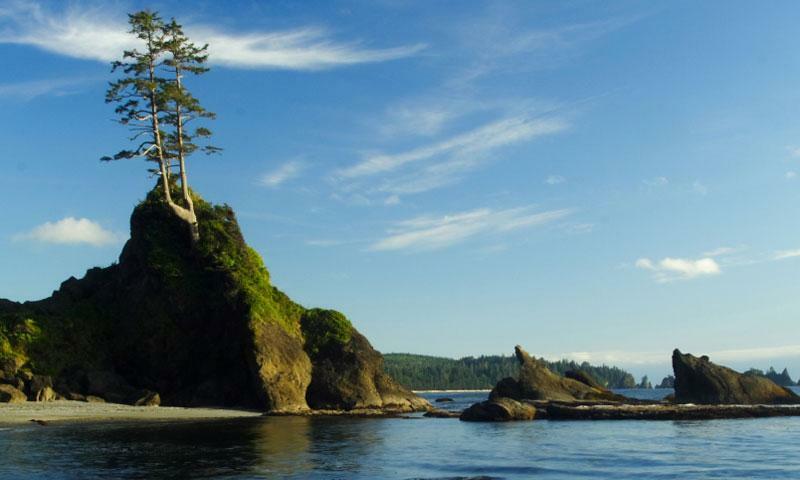 Shi Shi Beach is a clean, sandy beach that features amazing views of seastacks and wildlife. The beach is located on the northwest tip of the contiguous United States, in the Makah Reservation. Visitors must purchase a Makah Recreation Pass before visiting the beach. What can I see and do at Shi Shi Beach? Tide Pools: At low tide, Shi Shi Beach features shallow tide pools allowing visitors to get an up close view of giant, colorful starfish and sea anemones. Be sure to check the tide charts when planning your trips; these amazing pools should not be missed. Hike: With clean, sandy beaches and ancient headland forests, Shi Shi Beach is an incredible place to hike and explore. Hike to Lake Ozette: The North Coast Route leads hikers 15 miles (one way) along Shi Shi beach, along the romantic coastal cliffs, and through the ancient coastal spruce forest to the shores of Lake Ozette. Hike on the Beach: If you don’t want to leave the beautiful water views (and really, why would you?) walk along the sandy beach where visitors can enjoy miles of giant, washed up trees, unusual seashells, driftwood, and remarkable wave carved rock formations. Wildlife: There are a number of rare and beautiful animals that live (or stop during migration) at Shi Shi Beach. Birdwatchers will enjoy Great Blue Heron, Peregrine Falcons, and Western gulls year round. Visitors who come to Shi Shi Beach in late spring and in the summer have a good chance of viewing a large bald eagle. Bald Eagles often build their summer nests in the trees along the coast. Seals often make an appearance to the region. Keep your eyes on the horizon, Orca and Blue Whales are sometimes spotted off Shi Shi Beach. Point of Arches: Point of the Arches is a mile-long stretch of sea stacks and stunning natural arches. Watching giant waves crash into these large rocks is an awe inspiring sight. Where is Shi Shi Beach, WA? Shi Shi Beach is located on the Makah Reservation on the northwest tip of the contiguous United States. From Olympic Highway, WA-101 drivers should catch State Route 113, just west of Port Angeles. State Route 113 will become State Route 112/The Juan de Fuca Scenic Byway. Follow State Route 112 until it ends. Once in Neah Bay, turn left, heading west, onto Cape Flattery Road and following the signs toward the fish hatchery. In approximatly 3 miles, turn left onto Hobuck Beach Road. Follow Hobuck Beach Road to the parking lot. When is Shi Shi Beach open? Shi Shi Beach is open all year. It is accessible to non-campers from sunrise to sunset. How much does Shi Shi Beach cost? Visitors to Shi Shi Beach must buy a $10.00 Makah Recreation Pass as they enter the reservation. Passes can be bought at Neah Bay at the Makah Tribal Council, Warm House Cafe, Makah Marine, Big Salmon Fishing Resort, Washburn's General Store, Raven's Corner, or the Makah Mini Mart. The Olympic National Park Visitors Center phone number is (360) 565-3130.